Born in 1975 in Minden, Westphalia, Martin Schmeding studied church music, music education, recorder and organ (soloist diploma in both instruments), choir and orchestra conducting, harpsichord, and music theory in Hanover, Amsterdam and Düsseldorf. Through his teachers Ulrich Bremsteller, Lajos Rovatkay, Dr. Hans van Nieuwkoop, Jacques van Oortmerssen and Jean Boyer he is part of the important German organ tradition of Karl Straube, Guenther Ramin and Helmut Walcha, as well as of the French tradition and the Dutch historical organ movement. During his studies, he received a scholarship from the fund of the German people, the oldest and most important foundation of the German state. After receiving eight first prizes in the federal competition for young musicians, he was a prizewinner in many competitions, among them the Mendelssohn Bartholdy in Berlin, the Pachelbel in Nuremberg, the Ritter in Magdeburg, the Böhm in Lüneburg, the Competition of the German music universities in Hannover/Mannheim, the German music competition in Berlin/Bonn, the European competition for young organists in Ljubljana/Slovenia, and the Musica antiqua in Bruges/Belgium. He was a finalist in the ARD competition in Munich in 1999. In addition, he has received many grants and scholarships. In 1999, he was awarded the cultural grant from the state of Lower Saxony. Martin Schmeding was choir director and organist of the Nazareth Church in Hanover from 1997 until 1999. Between 1999 and 2004 he filled two of the most important posts for church musicians in Germany: In 1999, he was appointed as the successor of KMD Prof. Oskar Gottlieb Blarr at the Neander Church in Düsseldorf. 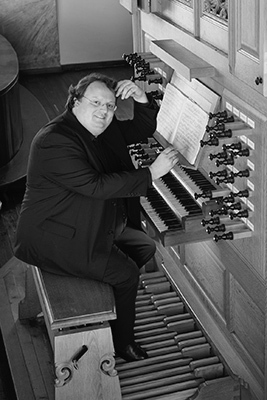 As titular organist at the Kreuzkirche in Dresden, a place with a more than 700 year old tradition of church music, Martin Schmeding worked from 2002 until 2004. After teaching in Hannover, Leipzig, Weimar, and Dresden, he taught as organ professor at the University of Music in Freiburg from 2004-2015 as the successor of Prof. Zsigmond Szathmáry, where he was also the chair of the church-music and organ department. In addition, Schmeding worked as a guest professor at the University of Music Luzern (Switzerland) from 2014-16. Since autumn 2015 he helds the Chair of Artistic Organ Playing at the University of Music and Theatre „Felix Mendelssohn Bartholdy“ Leipzig, alongside the directorship of the „European Organ Academy“. His students from all over the world are prizewinners of well renowned international competitions, e.g. the Bach Wettbewerb Leipzig, ARD competition Munich, Pachelbel competition Nuremberg, TokyoMusashino organ competition, Buxtehude competition Lubeck, Bach competition Wiesbaden, Schmidt competition Kitzbuhel, to name only a few. Many of them work as organists and organ teachers on important church and university positions. Martin Schmeding has made numerous radio and CD recordings, among them the complete organ music of F. Schmidt, J. Brahms, F. Mendelssohn Bartholdy, as well as the first recordings on a period instrument of the complete music for pedal piano by Robert Schumann and of the organ version of the Goldberg Variations by J. S. Bach on a baroque instrument. He has written for many publications and has given concerts as a soloist, chamber musician and with orchestras all over the world, including at important festivals such as the Bach-Fest in Leipzig, the Bachwochen Thuringen, the Chamber-Music Platform in Brunswick, the Organ Days in Merseburg, the Music Days of Lower Saxony, the Mecklenburg-Vorpommern Festival, and the Schleswig-Holstein Festival. Martin Schmeding is also active as a guest-lecturer at master-classes at home and abroad, publishes articles and music editions for important magazines and publishers, e.g. Schott, Carus, Herder and Butz. Engagements as a juror at competitions (e.g. Bach-Wettbewerb Leipzig, Pachelbel competition Nuremberg, Silbermann competition Freiberg, Ritter competition Magdeburg), conductor and composer complete his artistic career. In 2009 and 2017, he was awarded the Prize of the German Record Critics, in 2010 he won one of the most important European music prizes, the „Echo Classic Instrumentalist of the Year“-Award for „Joh. Seb. Bach, Goldberg Variations (Organ Version). Reviews of his concerts and recordings are enthusiastic, speaking of his performances as “breathtakingly virtuosic and full of genuine life” (The Organ/GB). “Martin Schmeding’s playing is superlatively good – good enough to allow you to forget there is someone working the instrument” (MusicWeb International) – "De vertolkingen van de Duitse organist Martin Schmeding zijn in een woord fenomenaal“ (Opusklassiek/NL) – „Martin Schmeding ist ein vollendeter Virtuose und zeichnet sich durch eine hohe Sensibilität aus“ (Muzycka21/PL) - "Inventif dans l’ornamentation de reprises, précis dans les articulations des variations les plus polyphoniques, attentif à l’effet qu’un dernier accord peut provoquer en function de sa duréé, Schmeding est un organiste complet.“ (Diapason/FR).